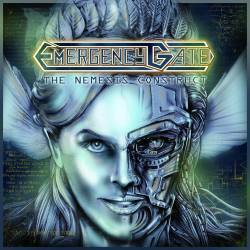 A year after their last album Rewake, German metal band Emergency Gate is already back with their next longplayer The Nemesis Construct. Signed on a new label and with one member gone, the sextet seems ready to make it to the top of the German metal scene. Unlike many other bands, Emergency Gate don’t want to stick to a single genre, but blatantly concoct their own sound from the ingredients Scandinavian death metal, power metal and even some metalcore. Although they hardly can claim to come up with something never heard before, the musicians are quite apt at putting a lot of ideas into their songwriting. With the tracks mostly between three and four minutes long, you’ll never get the impression that the musicians dwell on something for too long. The death metal influence makes sure that their power metal never sinks into the depths of pathos. The vocals by Matthias Kupka, formerly of Suidakra, are fiercely aggressive and match the instrumentation with the trademark dual guitar attacks and the well placed synthesizers. The Nemesis Construct is not overly accessible, and I doubt that it was intended otherwise. The production is dense and powerful while allowing every band member the necessary space to display their talents, no easy feat for such a heavy music with so many instruments involved. The Nemesis Construct is definitely not an album to be listened to half-heartedly, but I am convinced that a wide array of metal fans can discover much to like if they are willing to invest some time. It’s good to see that there are still artists around that build upon their influences instead of just blindly copying familiar patterns.